They say it was unusually strong November storm. But it last happened just three years ago. The temperature climbed to almost 70 today before seasonal air masses collided – and tornadoes spun their devastation in Illinois – touching down in several towns, killing at least three people… The effects were felt in downtown Chicago as the threat of a tornado forced the NFL to suspend the Bears game at Soldier Field and evacuate fans to safety inside the core of the stadium. This post was originally published on October 26, 2010 – but could have been written today. Yesterday, 5 days before Halloween, the temperature reached 72 degrees. Unheard of warmth for this time of year on the shores of the Great Lakes. But now, the wind is howling even though the rain has let up, and the temperatures have started to plunge. 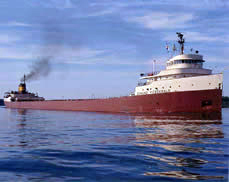 It got me to thinking about a song sung by a Canadian folksinger, and a huge, modern ship alone on Lake Superior in similar weather in 1975. Then, too, the gales of November came early. I sit in my warm house, candles and flashlights close at hand, just in case it gets real bad. The local media has declared us on storm watch because they think it makes their coverage more compelling. Using all their tricks – dramatic graphics, breathless reports, and correspondents standing sideways in the wind, pretending that they are feeling the full fury of the storm. At home, you’ll see video of the flipped semi, or the upended tree, or the touched down tornado, or whatever pictures arrive at the station by whatever means they come. They will be looped and repeated to mask the boredom of the constant repetition of whatever little news there really is, only to be replaced my new loops of more compelling video, or some actual news, if that ever arrives. If my power does go out – forget the computers and internet and home phone service and TV – these days, that stuff only works when there is power. Assuming the cell towers won’t topple, and they can handle the increased traffic, cell phones and mobile devices will be an alternate means onto the grid. Otherwise, I am out of options, and it will be me, my family and our candles and flashlights… huddled around the original wireless app… a transistor radio, running on batteries… tuned to a local all-news broadcast radio station. I took down the holiday decorations earlier, lest ghosts and witches come crashing through the windows. Now the wind gusts are upwards of 60 miles per hour. They will go higher later tonight. But just yesterday it was clear, calm and 72 degrees? How can this be? How can it all change so quickly? The truth is a huge storm is crashing through the Midwest. The Weather Service says in magnitude and intensity, it is the biggest in 70 years. And even if it never gets catastrophic in my neighborhood, somewhere something bad is happening to my neighbors. This storm is even bigger than the storm that sank the Edmund Fitzgerald – the largest ship on the Great Lakes when she was launched, and still one of the largest sailing these waters back in 1975 when she suddenly sank – dragging all 29 souls on board with her – 530 feet to the bottom of Lake Superior. Why that huge ship went down is a mystery to this day. On a lake for heaven’s sake! Despite the best technology of the day, the latest weather forecasts, and an experienced crew – she went down. I don’t know if the demands of the marketplace pushed “the Mighty Fitz” and her human cargo through a storm no one should have been out in. But the bottoms of all the Great Lakes are littered with the wreckage of catastrophic failures, whether caused by humans or human technology, as we bump up against Nature in just the wrong way at just the wrong time. You can also find remains in the still unreconstructed wards in New Orleans. Or the coastal towns of Indonesia. Or the regions of Haiti where Cholera is starting to surface months after the earthquake that brought this island to it’s knees. If you start to scratch the surface, you know our ability to predict these events is, and will always be, extremely limited. Storms and natural occurrences like these remind us that despite our bright and shiny technologies, we are not invincible. And that, like our ancestors, sometimes we just have to wait it out until and if Nature is ready to let us play with her again.